Portland officials will give the Occupy Maine protesters two days to clean and vacate Lincoln Park. PORTLAND — Armed with a judge’s ruling that closing Lincoln Park at night does not violate anyone’s First Amendment rights, Portland officials plan today to order Occupy Maine protesters to stop camping in the park. The city plans to give the protesters at least two days to remove their belongings and clean up the public park. Superior Court Justice Thomas Warren said in a decision issued Wednesday that the encampment itself, which has been in the park since October, is political speech. However, he said, city restrictions on overnight camping in public parks are not an unreasonable infringement of free speech and are intended to protect health and safety while ensuring that the public resource is not damaged. 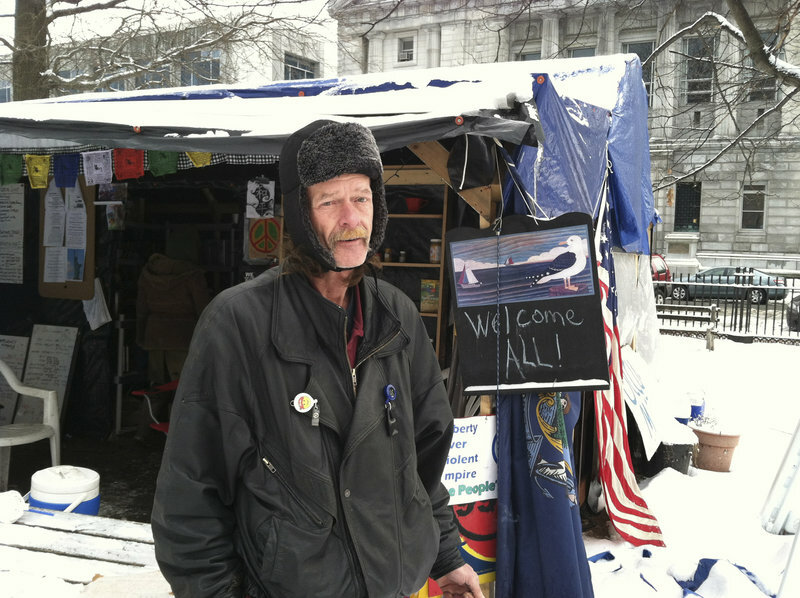 Also, he said, allowing Occupy Maine to camp in the park could prevent others from using it, infringing on their rights. The protesters held a previously scheduled general assembly Wednesday night to discuss the decision and the city’s call for them to leave the park. Their attorney, John Branson, said they made no decisions about their response. Harry Brown, a plaintiff in the case who said he has been camping out since fall, said Wednesday afternoon that he knew the lawsuit was a long shot but he still was disappointed by the ruling. Branson said that even if the group appeals the ruling — which would be difficult because it was not a final decision after a trial — the city will be entitled to enforce the law at least for the time being. Branson said the court did side with the protesters in agreeing that they are engaged in political speech, and even if it ends this weekend, the encampment has been worthwhile, he said. “There’s no question that they’ve accomplished a great deal in terms of bringing certain issues into the mainstream public debate that were outside the public debate,” Branson said, including economic inequality, excessive corporate political power and Wall Street’s greed. “If these folks are committed enough to sleep out in the bitter cold and rain and snow, you can be sure they’re willing to continue their effort in whatever way, shape or form they can to keep these issues at the forefront of the public’s consciousness,” he said. Branson said he does not know if two days will be enough time for the demonstrators to break camp and clean up the park. The city has offered to provide a Dumpster to help with the cleanup and indicated that its two-day deadline for moving out is flexible. Branson applauded that approach. City officials first told Occupy Maine to leave the park on Dec. 15, after the City Council denied it a permit to stay, but they said they would not move to evict the protesters until the court case was resolved. The number of demonstrators camping out in the park dwindled as winter weather arrived. Members have said perhaps 15 to 20 people still camp there regularly. The group started its protest in Monument Square at the beginning of October, in solidarity with the Occupy Wall Street movement. The city manager offered to let the protesters camp in Lincoln Park, where their presence would not disrupt businesses, even though local ordinances prohibit loitering in city parks from 10 p.m. to 6:30 a.m. daily. The number of political signs and tents grew as people were drawn to the protest. So did police calls and concerns about sanitation and fire hazards. Some campers were using propane stoves inside tents, and many used hay bales as insulation. Growing criticism from the public set the stage for the court challenge. At a hearing in Cumberland County Superior Court last week, the city argued that camping is not the same as protesting. The city must allow demonstrators to exercise their freedom of speech and assembly, and their right to petition their government, but it does not have to do it in a way that conflicts with reasonable ordinances designed to serve valid government interests, the decision said. Warren said he had to determine whether the city’s ordinances and actions were consistent regardless of the content of the political speech, whether adequate standards exist to prevent arbitrary decisions by government officials and whether protesters had other means of communicating their message.